Bottles filled with an assortment of perfumes on display at the La Source Parfumee in the village of Gourdon in the Provence, France in Europe. 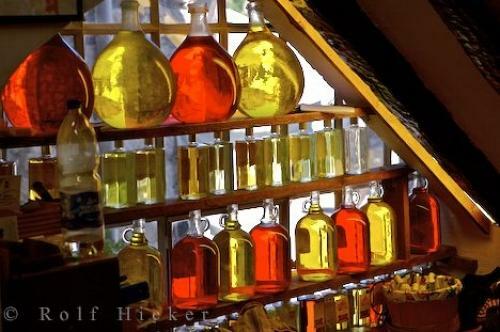 Photo of colorful bottles of different perfumes on display in the Gourdon village in the Provence, France. ... Perfumes on display at La Source Parfumee, Old Distillery and Candle-making Workshop in the Village of Gourdon at 760 metres in the Alpes Maritimes, Provence, France, Europe. I photographed this photo with the digital SLR camera model Canon EOS-1Ds Mark II, aperture of f/4.5, exposure time of 1/200 sec. on ISO 100, as always I used a original Canon Lens, the focus lenght for this picture was 70mm.